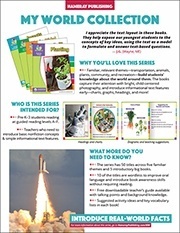 Differentiating in Science through Leveled Texts—with FREE Download! Today's guest blogger is Susan Weaver Jones, an elementary educator from Orlando, Florida, who currently works in Knoxville, Tennessee. She has taught students in Kindergarten through Eighth Grade as a Classroom Teacher, Reading Specialist, Reading Recovery Teacher, and Literacy Coach. She is also the author of three leveled readers in the Kaleidoscope Collection. You can read her other guest posts here. Teaching science in the primary grades can be challenging, depending upon the resources available. Hands-on, participatory experiments successfully capitalize on students' curiosity and interest in exploration. However, class-size amounts of consumable materials and needed equipment may be limited, due to budget constraints. In addition, some science topics may require more reading-to-learn opportunities due to practicality, as well as cost. The same funding issues can affect textbook availability, too. Even when textbooks are provided, though, concerns may arise about the difficulty of the textbooks as compared with students' reading abilities. 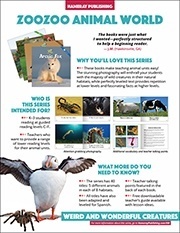 Given the range of reading levels in many elementary classrooms, coupled with unfamiliar science vocabulary, the difficulty of many science textbooks may exceed the instructional reading levels of some students. What alternative instructional options do teachers have? Before reading, teachers can access their students' prior knowledge through discussion of a KTWL chart. Determine what the students already know, what they think they know, and what they want to learn. At the conclusion of the study, the teacher can revisit the chart with the class to find out what the students have learned. If some questions are left unanswered, the teacher may choose to reference other sources through online research to satisfy students' inquiries. Students can keep track of the information they locate through the use of jot charts. Jot charts are simple graphic organizers that allow writers to keep information about topics in one place. Using selected questions from the KTWL charts (which could vary by student, as needed), students record answers to the questions and include the title and author of each source on the jot charts. When students use nonfiction texts in conjunction with jot charts, they learn how to seek information and take notes from sources other than themselves. Some students might record information from single texts (including photographs), while other students might be capable of using information from two or three sources in their jot charts. The jot charts can then serve as references for students to review information and as means to summarize their learning. Students can also refer to the photographs in leveled texts to create illustrations that depict the information they've learned. No longer solely dependent on what they can remember after reading, students can reread and compare their information with others from their jot charts. When teachers incorporate different levels of text on the same topics to accommodate their students' reading levels in content areas such as science, they open up new avenues of learning for all of their students! 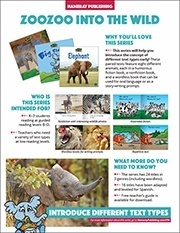 If you'd like to learn more about our Zoozoo Animal World series, click the images below to download series highlight sheets! Click the worksheet image at the bottom to download the free charts.